The SPERANZA loading scrap metal in Tilbury. No further details RJ. The bulk carrier SPERANZA, which was built in 1963, was owned by Marhaba Shipping Ltd, of Monrovia, Liberia, was registered in Panama, and managed by a Greek outfit called Adelanga Shipping. Up to 1982, the 12,986 tons gross, 19,400 tons deadweight, vessel had several names and several owners, but the then most recent name was ESPERANZA, which at least cut down on the cost of painting the name on the ship when it changed hands. Did you take this photo in May or early June 1985? 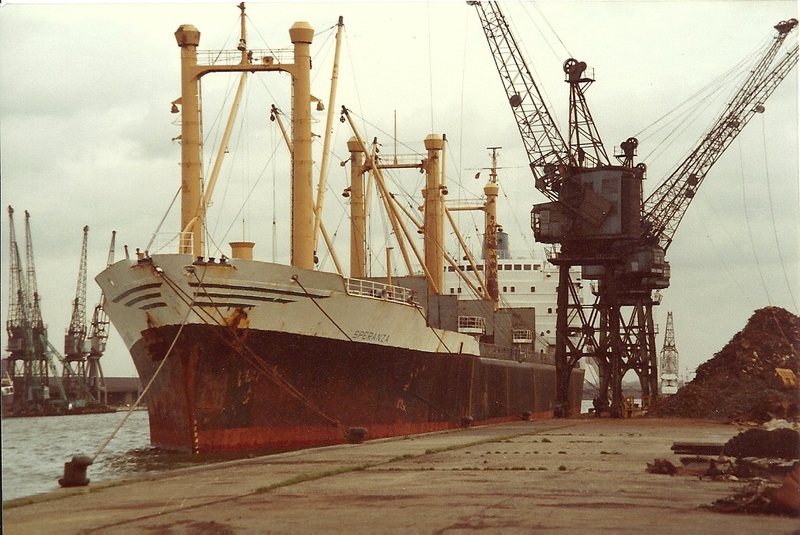 If so, quite apart from the tatty condition of the hull paintwork, it would tie in very nicely with the fact that SPERANZA had then been sold to shipbreakers in the People’s Republic of China and it arrived at Nantong on 18 July 1985 to be scrapped. Quite frequently, ships that are destined for scrapping in China carry to their final port a cargo of scrap steel, which helps to satisfy the enormous appetite of the Chinese steel industry.